A hand tool with curved sealed glass vials containing a liquid and a bubble of air. 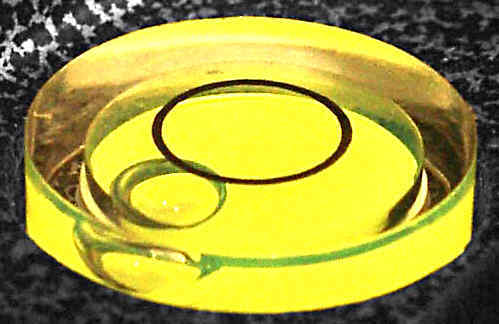 The glass bubbles are located parallel to or at right angles to the body of the level to give horizontal or vertical readings. Short levels that are convenient to pack in a tool kit or overall pocket. A short level built to exacting standards with graduations on the glass surface. What you see above is a brass level that was sold in the early days of the instrument. They could be bought separately and the tradesman would fix them into a straight length of timber. A level to most people is the common mass produced usually aluminium framed, bubble level. So called because the first ones were a bubble of air trapped in a curved glass cylinder filled with water. The water levels had the problem that in cold weather they would freeze and crack the glass. 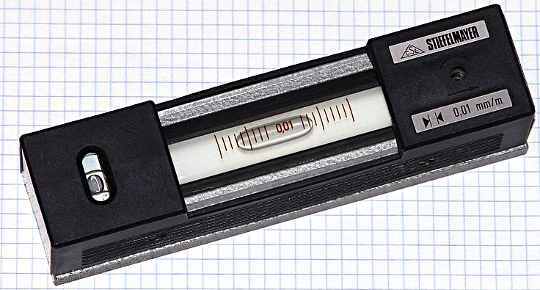 Later low freezing point liquids like ethanol were used and so the name spirit level was coined. The glass tube that contains the liquid with the bubble of air. The principal of the level is that a sealed glass tube has a small amount of air left in it which forms a bubble. The glass tube has a very slight swelling in the middle so that the bubble naturally wants to sit in the middle when the tube is level. The modern levels are not only safe from freezing damage, but they are almost always set into a solid block of resin/plastic that protects them from shock and so they stay accurate a lot longer than the old ones used to do. Look for this feature when selecting a level. I like the Stabila brand. I bought my first Stabila when I was 18 after being invited by a salesman to belt a sample of one of the resin protected bubbles with a hammer. Prior to that the bubbles were glass and easily broken. That level lasted me for many years. I got rid of it when it became too hard to read because the plastic was so scratched. I still have a 1200mm Stabila and a couple of shorter ones. A feature of that old level that is rarely seen these days was that the bubbles could be read from the ends of the tool. So when I was doing formwork I could lean inside a shutter from the top, hold it to the inside face and look down on the end and read the bubble. The engineer's level above would be far more expensive than the average construction workers tool. They are made to very precise tolerances and they should be treated with care. Look closely at the bottom right of instrument. What it is indicating is that for every graduation that the bubble is out of centre, Then the surface is out of level to the extent of 0.01 millimtre in every metre.Think about it! An incredible degree of accuracy for a bubble or air in a glass tube. Short levels are often called torpedo levels. Often the come as the smallest one of a set that is almost free. They are handy to carry around in a pocket or a nail bag when doing certain types of work. 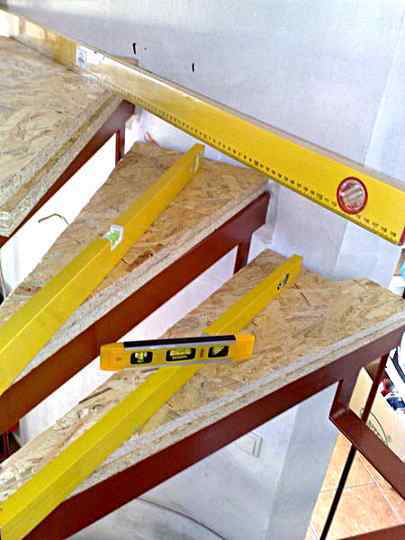 Although a long level is very desirable there are times when they just can't fit inside the area being tested. This page is only a brief introduction to the subject, there are small levels that can clip onto string lines, some set into other tools like square and protractors. 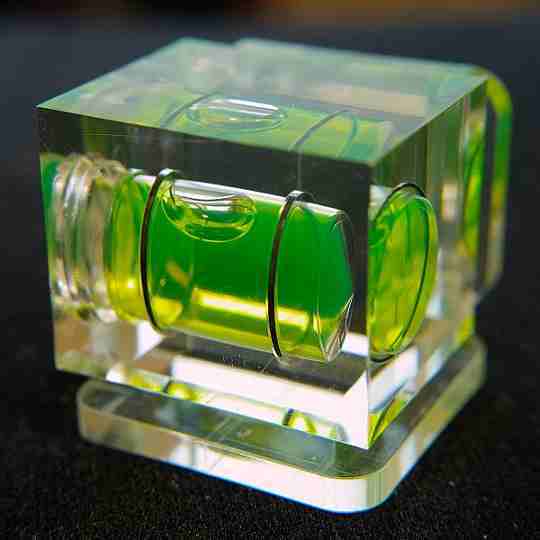 A small Bullseye spirit level set in a resin block. Many tripods or tripod mounted instruments like cameras or auto levels have small bullseye levels as an aid to levelling them. When the bubble is centred, then the instrument is set on a level plane. These are fairly fiddly to set and not all that accurate but when there is a need for greater accuracy then other methods are used. Stabila once more at the forefront of innovation. Quick tip: To check a spirit level, for level (horizontal) or plumb (vertical). find a good clean surface that is just about level or plumb. .
Read the bubble and note how it sits in relation to the graduation marks. Put a pencil mark at the end of the level. Flip the level 180 degrees placing the opposite end on the pencil mark so that it is in the same place as before but reversed. If the bubble is in exactly the same relative position as before then the level is true. If it is not in the same position then the level is out by half the distance shown. So if the bubbles have an adjusting screw then move the adjuster so that the bubble is half way the total difference.